Handsome and complex, Hans is greatly anguished by Betsy's captivity and turns to Tessa Bauer for comfort. Eagerly, Tessa responds, overlooking troubling signs of Hans's hunger for revenge. When Betsy is finally restored to the Amish, have things gone too far between Hans and Tessa? 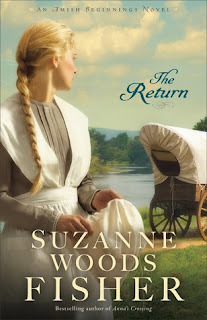 The Return is the third book in the Amish Beginnings Series, it takes place 20 years after The Newcomer and Anna's Crossing. Well it does work fine as a standalone I recommend starting from the beginning just because it's a great series and you really get to know the characters. When Indians attack close to Anna and Bairn's emotions run amok, for Hans it is heartache, anger and helplessness, for Tessa's guilt and confusion. There is soul searching in store for both, but not always with a positive result. Playing off of real historical events the author has again written a captivating novel full of emotion and intrigue, keeping me glued to the pages. It wasn't hard to feel the atmosphere and visualize everything taken place, from the wild stallion to the Indian reserve and just sitting around the kitchen table. A real eye opener to what what newcomers had to endure and the relationship with Indians (both good and bad). Again Felix was one of my favorites, now a widower raising twin boys on his own brought me back to the crossing and his antics – just adding that extra spark to round out a great story. Faith plays a big role here, a lot of soul-searching takes place and it's through these dire situations where one is tested they discover who they truly are. I am so glad to have discovered this author my thanks to Graf Martin Communications (Nuts About Books) for the opportunity to review this one.